Located in the beautiful village of Wimberley, Blair House Inn is a luxurious Texas Hill Country bed and breakfast that offers a relaxing and romantic getaway. Renowned for gracious hospitality and unrivaled service, Blair House Inn features luxurious accommodations in the form of guest rooms and cottages, individually designed with unique accents, and special touches. Lodgings have private bathrooms and modern amenities to ensure absolute comfort and style, and walls are adorned with original oil, watercolor and acrylic paintings from the surrounding artists’ community. Upscale facilities and guest services at Blair House Inn include a premier day spa that offers pampering massages and indulgent spa treatments, an outdoor swimming pool, and whirlpool spa tub, an on-site cooking school, which offers classes throughout the year, and beautiful gardens in which to relax. Known as the Star of the Texas Hill Country, the eclectic and vibrant artists’ community of Wimberley offers a variety of art galleries and boutiques, as well as outdoor and recreational activities such as wine-tasting, zip-lining, fishing, hiking, boating, and swimming. Blair House Inn features well-appointed and individually decorated guest rooms and cottages with unique characters, stylish décor and contemporary furnishings. Both guest rooms and cottages feature comfortable double, queen or king-size beds with pillow-top mattresses, high-thread-count linens and hypoallergenic pillows, and en-suite bathrooms with shower/bath combinations, fluffy towels and spa bathrobes, and branded toiletries. Three private cottages have bathrooms with two-person whirlpool tubs and separate marble showers, and spacious living areas with sofas and armchairs, stone fireplaces, microwaves, refrigerators, and coffee makers. All lodgings have modern amenities including flat-screen televisions with cable channels and DVD players, CD/ iPod players, mini-fridges, irons and ironing boards, and complimentary high-speed wireless Internet. Extra touches include fresh flowers and handmade chocolates, and daily housekeeping services. A complimentary homemade breakfast is served in the mansion’s downstairs parlor every morning and includes freshly brewed coffee, tea and other hot beverages, fruit juices, fresh fruit platters, yogurt, cereals, hot entrées and signature dishes, such as Huevos Rancheros, Hill Country Eggs Benedict, and Toasted Walnut Cinnamon Apple Cake, along with eggs, and freshly baked bread, muffins, scones and more. Blair House offers a variety of picnic basket lunches that can be enjoyed in the comfort of the guest rooms, under a shade tree on the beautifully landscaped grounds, at a scenic overlook or next to the river. Guests can also select exclusive extras such as cheese and cracker trays, mixed nuts, and chocolate covered strawberries. Deluxe amenities at Blair House Inn include a premier day spa that offers pampering massages and indulgent spa treatments, an outdoor swimming pool, and whirlpool spa tub, an on-site cooking school, which offers classes throughout the year, and beautiful gardens in which to relax. A gourmet breakfast is served every morning in the dining room, and a variety of picnic basket lunches can be enjoyed in the comfort of the guest rooms, under a shade tree on the beautifully landscaped grounds. 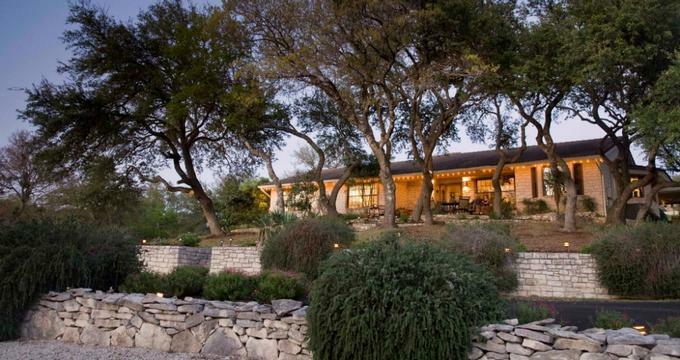 The Inn also offers special Saturday evening and holiday dinners, which are open to the public and celebrate Texas Hill Country cuisine and excellent local wines. Guests can also select exclusive extras such as cheese and cracker trays, mixed nuts, and chocolate covered strawberries for their rooms. All lodgings have modern amenities including flat-screen televisions with cable channels and DVD players, CD/ iPod players, mini-fridges, irons and ironing boards, and complimentary high-speed wireless Internet. The Cooking School at Blair House Inn offers a range of hands-on cooking classes that aim to build confidence in the kitchen by teaching basic culinary principles and techniques, ranging from purchasing freshest seasonal foods to food preparation and presentation. Classes for all levels are available throughout the year. The picturesque village of Wimberley offers a wealth of things to see and do from cultural and arts activities to outdoor recreational fun. Surrounded by pristine natural landscapes that include the Blanco River and sparkling Cypress Creek, rolling green hills and vineyards that stretch for miles, outdoor-lovers will delight in the array of activities there are enjoy such as hiking, mountain biking, climbing, fishing, boating, swimming, golf, tennis, and camping. The village is renowned for its artistic community, and there are several quaint shops and studios, along with many excellent art galleries, museums and markets to browse, and plenty of events and live music venues in the area.